The very first Soroptimist club formed in 1921 in Oakland, California. At that time, according to Soroptimist history, women who were interested in volunteering in their communities were not permitted to join male service organizations such as Rotary or the Lions. Since then, Soroptimists have worked to help women and girls improve their standing in the world. The organization now has 75,000 members in 130 clubs around the world. La Mesa became one of those clubs in 1951. Their group is a mixture of those working and retired, ranging from women in their 20s to women in their 80s. “We’re helping women advance and see the potential that they have,” said member Jennifer Casio. Casio joined four years ago at the encouragement of her former professor and former boss, both of whom are still mentors in her life. She calls them “very impactful” in her career path as a social worker and now executive director of the Consensus Organizing Center through San Diego State University. Being a part of the Soroptimists is a way for her to “pay it forward” and share the same support she was given. 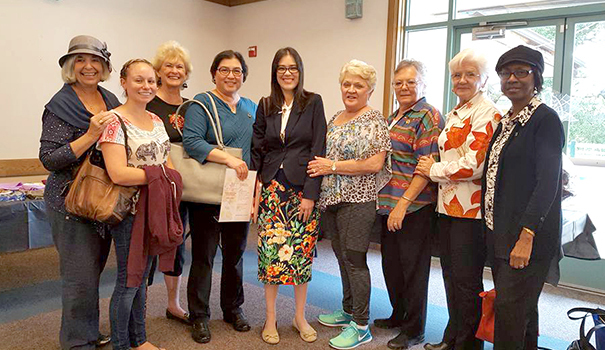 The La Mesa Soroptimists offer this through the community they build and service they offer. They believe that women, young and old, can achieve their dreams with just a little extra support. That support comes through programs such as Live Your Dream Awards and Women’s Opportunity Workshops, and working alongside other local groups with a complementary mission. In La Mesa, Live Your Dream is one of the biggest endeavors the club undertakes. Each year, they award $1,000-$2,000 scholarship(s) to deserving women. Applications are distributed throughout the La Mesa and San Diego State University community, and include an essay and final interview. According to Casio, the awards chair, eligibility requirements include being a woman who is the head of her household with dependents (which can be children, parents, grandchildren, etc. ), has financial need, and is enrolled in school full-time. But the winner has to do more than have the right numbers. 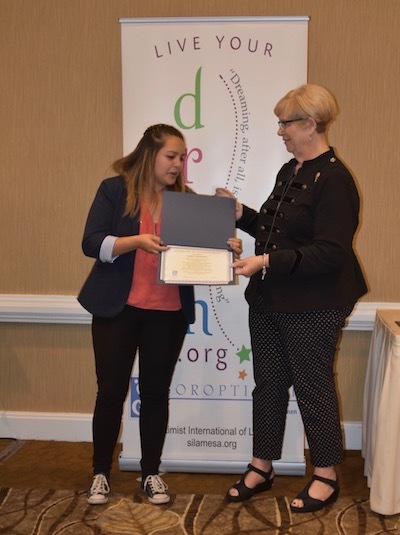 On Nov. 22, Soroptomist International of La Mesa sponsored their 60th annual Pre-Thanksgiving Community Breakfast where the group highlighted recent Live Your Dream recipients from around San Diego County, including La Mesa’s 2017 recipient Edith Carmona. The event featured keynote speaker LaDreda Lewis who is executive director of Sylvan Learning Center of La Mesa and CEO of 40 Acres and a Mind, Inc. In December, winners are chosen for the following year’s awards. The women chosen for 2018 are Daysi Portillo, studying social work at San Diego State, and Brianna McClory, attending Ashland University for behavioral science. The club will officially meet these role models at the annual Desert Coast Region Spring Conference. The 39 clubs in the Southern California area come together for a whole weekend. The crowning moment is Sunday morning, when two Live Your Dream award winners from each district are introduced. They come with their family and present their stories. And by the time they’re done, there is rarely a dry eye in the house. “Everybody has Kleenex,” shared Lisa Moore, who serves as Desert Coast Region Secretary. Moore has been with Soroptimists of La Mesa going on 40 years. She learned about it through her business network when she and her husband owned several travel agencies. 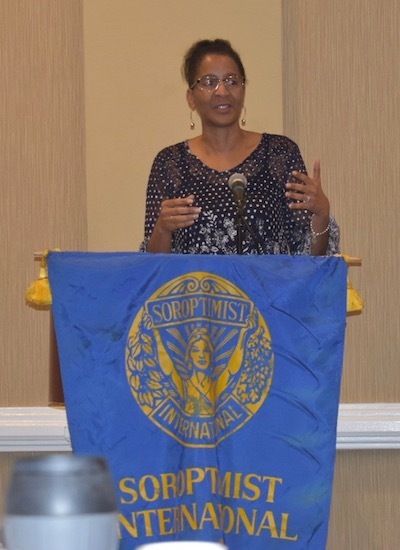 Moore said that when she first joined, the Soroptimist service efforts were scattered across several areas. Now, they are more focused on the “dream programs” like the aforementioned Live Your Dream. The Women’s Opportunity Conferences also encourage dreams, offering a full day of education and training. Speakers, a resource table and table-top workshops help equip women to overcome personal challenges, further their education, find and retain employment, and manage their money. This year, the club is changing its format. Instead of bringing women into a conference, they are bringing the conference to them. Women’s Opportunity Workshops will be hosted in several places around San Diego County that work with women in economic challenges and abusive situations. La Mesa Soroptimists also reach out to the younger set through Dream It – Be It, which works with girls in secondary school. Soroptimists mentor and host events in topics such as setting and achieving goals, overcoming obstacles, and finding career opportunities. “We have a saying – you come for the service, you stay for the friendship,” member Mary Hubbard said. Hubbard has been with the club since 1986. She was meeting with a potential client for her then-news service business, and the subject of Soroptimists came up in the course of conversation. Although Hubbard has since changed careers and is now retired, she is still an active member of the club. “I leave meetings feeling energized and inspired every time,” she said. To learn more or be inspired by Soroptimist International of La Mesa yourself, visit their website at silamesa.org or call 619-940-4812. You can also attend a meeting, held on the first and second Thursday of each month, at 7:30 a.m. in Denny’s on 2691 Navajo Road, El Cajon. —Freelance writer Joyell Nevins can be reached at joyellc@gmail.com. You can also follow her blog Small World, Big God at swbgblog.wordpress.com.